Remove roast from oven. Let stand 15 minutes before slicing to serve with stuffing. Meanwhile, in large bowl thoroughly combine ground pork, bread cubes, broth, onion, celery, walnuts and seasonings; mix well. In medium saucepan, combine rhubarb and sugar; bring to a boil. Pour over stuffing mixture; mix lightly. Spoon into buttered 2-quart casserole. Cover, bake at 350 degrees F. for 1½ hours. This elegant centerpiece entrée is actually very easy to prepare. 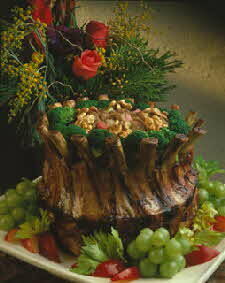 Have the butcher cut and tie the crown roast for you. Simply roast, and bake the stuffing alongside in a separate casserole. Serve with buttered green beans amandine, a fruit salad and warm dinner rolls.